Being a renowned and the most popular enterprises in this field, offering an optimum quality array of Bed Panels for our customers. These products are made from optimum grade basic material. We provide Bed Head Panel - 12, which is designed by experts and contains different controls that are used to monitor patient’s health. 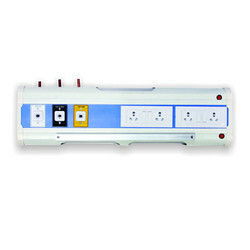 Our Bed head panels are ergonomically designed keeping the needs of wards/ICU/Private room in view with the desired Medical gas outlets, electrical sockets and other accessories. These are extruded Aluminum panels, powder coated as per customer's choice of colour to maintain the aesthetics of the hospitals. While climbing on the success ladder, it has become increasingly important for us to offer an exclusive assortment of Designer Bed Head. We are engaged in manufacturing and supplying a wide range of Bed head Panel (Single). The offered panels are manufactured using premium quality material and advanced technology in compliance with the international standards. Also, the entire range is checked on various parameters in order to ensure its flawlessness. Clients can avail the offered products from us at market leading prices. - Usage: Medical centers, hospitals, etc. MGI Bedhead Service Units provide grouped services at each patient or treatment location. 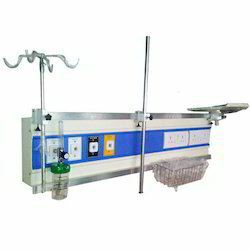 BHU are designed to provide a convenient and flexible supply of electrical power, lighting , medical gases and communications to the head of the hospital bed. We are affianced in offer an elite range of Bed Head Panel. The provided range is made by professionals employing the sophisticated techniques and optimum quality material which is attained from top merchants of market. These products are available in all parameter sizes that meet on precise necessities of our patrons.